11 December 2015. The Kenya National Biosafety Authority (NBA) has formally received comments from the public as it embarks on analyzing feedback for consideration of the application for environmental release (open cultivation) of Bt cotton in Kenya. 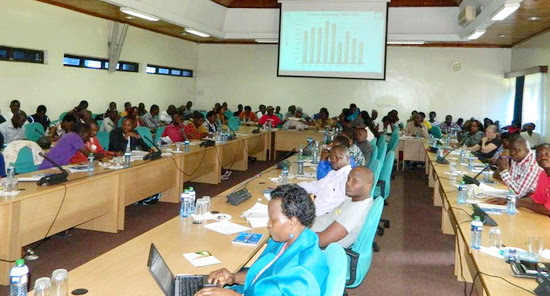 The public forum was organized four months after Kenya Agricultural Research Organization (KALRO) filed a similar application for insect protected maize under the WEMA – Water Efficient Maize for Africa project. More than 100 stakeholders, mainly farmers, consumers, academia, media, and students attended, where further clarifications on the application were presented. NBA regulators outlined key components of the application and the rationale for soliciting public comments as stipulated in the Biosafety Act 2009. Speaking at the event, Dr. Charles Waturu of KALRO, who has been working as the Principal Investigator on Bt cotton research for the last 10 years, explained that research done at the national agricultural research center has confirmed the efficacy of Bt technology in controlling the African bollworm. He added that Bt cotton would only require 2 sprays instead of the average 10 sprays necessary for conventional cotton. Thus Kenyan small scale farmers will realize considerable savings on production costs from Bt cotton. “Bt cotton could revive Kenyan textile industry from a meager 20,000 ha of cotton currently to more than 350,000 ha” said Dr. Waturu. Echoing sentiments of many who attended the meeting, farmers were eager to know when Kenya would embrace Bt cotton. “We should stop having baseless arguments and start talking about when we will get the Bt cotton seeds” said Mr. Muriuki, a farmer. “This public meeting is an eye opener for us. We now have adequate knowledge and will support Bt cotton if it is going to assure jobs for the youth” said a member of Bunge La Wanainchi, a Caucus which gathers opinions at grassroots on national matters. NBA’s approval process for environmental release takes 90-150 days from the date of acknowledgement of the application. A decision is thus expected in February 2015, followed by national performance trials by the Kenya Plant Health Inspectorate Service (KEPHIS). 26 November 2015. Zambia National Biosafety Authority Launched. The Zambian government has launched the National Biosafety Authority (NBA), whose core business is to regulate genetically modified organisms (GMOs) or products of GMOs in the country.